Experiments are the most effective way to learn about the world. By cleverly interfering with something to see how it reacts we are able to find out how it works. In contrast to passive observation, experimenting provides us with data relevant to our research and thus less time and effort is spent separating relevant from irrelevant information. The art of experimentation is often learnt by doing, so an intuitive understanding of the experimental method usually evolves gradually through years of trial and error. This book speeds up the journey for the reader to becoming a proficient experimenter. 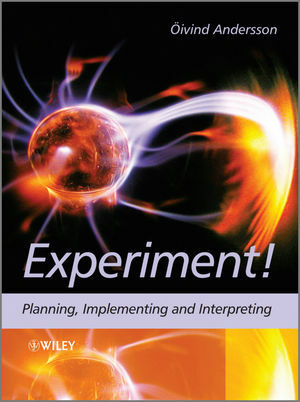 Organized in two parts, this unique text begins by providing a general introduction to the scientific approach to experimentation. It then describes the processes and tools required, including the relevant statistical and experimental methods. Towards the end of the book a methodology is presented, which leads the reader through the three phases of an experiment: ‘Planning’, ‘Data Collection’, and ‘Analysis and Synthesis’. This book focuses on general research skills, such as adopting a scientific mindset, learning how to plan meaningful experiments and understanding the fundamentals of collecting and interpreting data. It is directed to anyone engaged in experiments, especially Ph.D. and masters students just starting to create and develop their own experiments. Dr Öivind Andersson is Assistant Professor in the Department of Energy Sciences at Lund Universitytransparent engines and works with optical measurements in transparent engines. His responsibilities include supervision of several Ph.D. students thus providing opportunities to reflect on how to develop their abilities as experimenters and he has developed and taught a faculty-common Ph.D. course on experimental methodology that partly forms the basis for the proposed book. Before joining Lund University he worked for seven years for the Volvo Car Corporation, both with optical and traditional engine experiments and his duties varied from product development to research tasks. He monitored several of the company's research projects at universities, and was often engaged in discussions about how the outcome of the efforts invested in their experiments could be improved. In 2006 he received the Henry Ford European Technical Achievement Award, for development of a "Low Temperature Concept for Low Emission Diesel Engines", with L. Jacobsson, J. Somhorst, and A. Lööf. He has authored and co-authored 20 scientific publications.